This is a stainless steel falafel maker, not like other plastic imitations, similar to the ones used in the Middle East to make falafel. 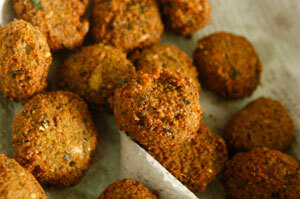 It can be used in commerical enviroment as well as any household kitchen to make falafel. The falafel maker is stainless steel and simple to use with a hand operated latch to pull/push out the falafel and it is has been tested in commercial kitchens in the UK and used to make falafel on a daily basis. The falafel maker is supplied in standard plastic see through packaging. To operate the falafel maker you move the latch on the side of the falafel maker back put the falafel mix in the mould using a spoon and then place the falafel maker over your fry and push the latch manually forward so the mix drops into the fryer and forms the shape of a falafel. The latch on the side of the falafel maker is totally hand operated and not spring loaded. it is recommended that you use a table spoon to scoop the falafel into the falafel maker as we find this easier. You can easily make 100 falafel's or more an hour with this falafel maker and we offer a refund policy on this item. Please see the refund policy below. If you are unsatisfied with the Falafel Maker you can return it within 14 days in packaging and get a refund, excluding postage costs. Buy a falafel maker, falafel mould, falafel mold, falafel scoop, stainless steel falafel scoop, online and make falafel with this high quality stainless steel falafel maker that can be used in any commercial kitchen or at home to make falafel.